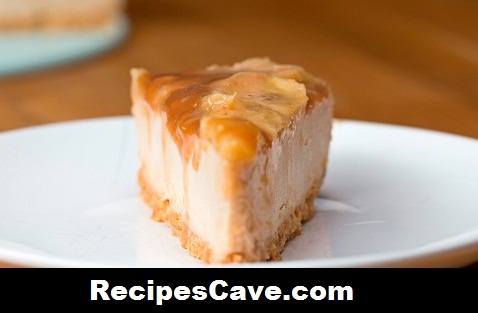 Caramelized Banana Peanut Butter Cheesecake Recipe - Once again this is fruit recipe, so everyone of you will love to taste it. This recipe is about banana with cheesecake. Let's see how to cook. 4. In a large bowl, combine softened cream cheese, vanilla, powdered sugar, and peanut butter until well mixed. 5. Add the cream cheese mixture to the springform pan and refrigerate at least 1 hour. 6. In a saucepan on medium-high heat, combine brown sugar, butter, half & half, and cinnamon, and stir until mixture darkens and sugar dissolves into mixture. 7. Lower the heat to medium-low and add the bananas to the saucepan and sauté in sauce for 1-2 minutes on each side. Take off heat and let rest for 10 minutes. 8. Decorate the top of the cheesecake with banana slices and pour over remaining caramel sauce. Chill for at least 30 minutes. 9. Garnish with chocolate or caramel syrup. Your Caramelized Banana Peanut Butter Cheesecake Recipe is ready to taste.